Fairytales are all the rage these days, not just in horror but right across the entire mainstream spectrum. With shows like Once Upon a Time, The Grimm Brothers and Disney productions like Frozen ostensibly based on the Snow Queen, you might be forgiven for believing the well of European myths had been drained.But really, most stories used today are just the nice ones. Scriptwriters and film makers have a wealth of legends, stretching back generations to choose from when considering new and curious ways to tell stories. Kristen Erskine has a post graduate degree in Celtic Studies which encompassed archaeology, history, onomastics and folklore. 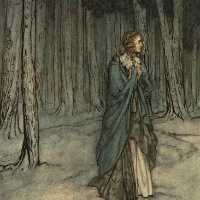 From there it was an almost natural step to the roots of European fairytales and the connections across cultures.